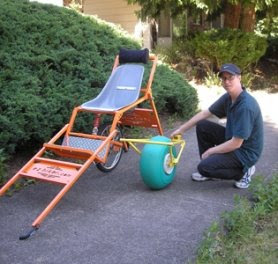 The Clackamas Review in Oregon reports on the development of a wheelchair that makes hiking more accessible. Designed by Bill Stites, owner of Stites Design in SE Portland, the EZ Hiker will hopefully make the camping and hiking more accessible for wheelchair users. The idea for EZ Hiker came from Tom Ruedy, who is disabled and has been working with a cycle company on the design for about 8 years. When cycle company became too busy with other projects, Stites, an industrial designer, came onto the project. The EZ Hiker will “allow people with disabilities to go anywhere an able-bodied person can go, and it can be used in search and rescue and other functions,” Stites said. He says the EZ Hiker has a single wheel powered by a person in front and behind; the chair also has suspension and shock absorbers. “It is all about access,” he said, adding that the single wheel enables the “mushers” to carry the chair on a single-track trail. Ruedy added that the EZ Hiker can be easily adapted for a child, so a child’s car seat could be put onto the adult seat.